Title: 'Royaume de Pologne'. Paris, c. 1710. 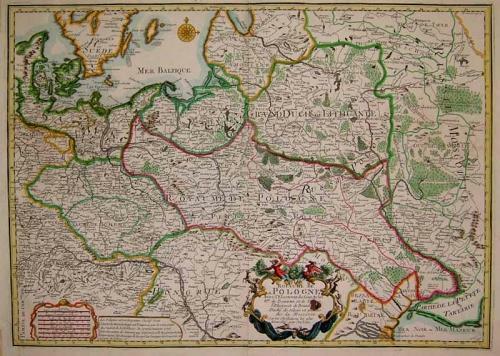 Large map of the Kingdoms of Poland (with the Grand Duchy of Lithuania and Ukraine), Bohemia and Prussia, the Electorates of Saxony and Brandenburg, Duchy of Silesia, and part of Russia-Muscovy. Visible in the lower portion of the map are Hungary, Bessarabia, Moldavia, Tatary and a portion of the Black Sea. In the upper lefthand corner are Denmark, part of Sweden and the Baltic Sea. French engraver, Charles Inselin (Inslain), was born in 1675 and was still active in Paris in 1725. He engraved a variety of maps for Guillaume Delisle, Nicholas de Fer and Bernard Jaillot. In very good condition, except for a very old small spot in the cartouche and remains of some tape in the margins (used for mounting) well away from the image area. The image is bright and the paper strong. Seldom seen on the market.